The disasters of 2017 are an alarming portent of catastrophe’s and adversity ahead. Around the world disasters piled up like cord-wood. This was the second most costly year for natural disasters and weather related losses broke all previous records. The highest record was in 2011 due to the Tohoku earthquakes and floods in Thailand totaling $350 billion. Currently, we are sitting at $330 billion for 2017. All numbers given are in US dollars, except one Euro quote. 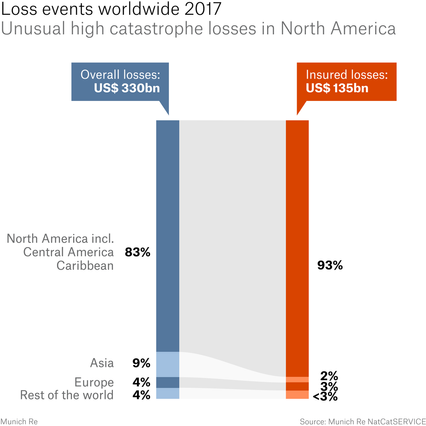 The Munich Re NatCatSERVICE recorded 710 relevant loss events, which is above the average for the last ten years. It is critical to note that the numbers here only reflect large globally registered disasters. The average number of disasters in the last decade is 605 registered events a year, which is up from the 490 events for the last 30 years. The 600 mark has been exceeded only five times in history, all of them in the last six years. There have been 19 especially devastating disasters. Insurance covered loss in 2017 came to $135 billion while the numbers keep being tabulated, even though we have rolled into in a new year. They say a picture is worth a thousand words, and these pictures show a disturbing trend spiraling upward. 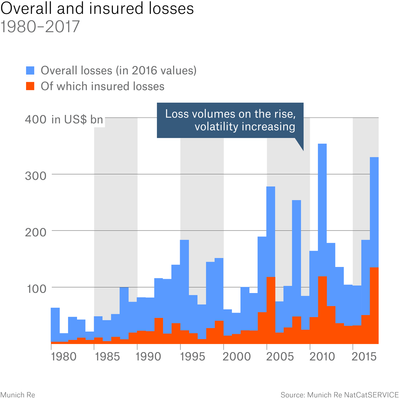 Whether or not victims of these disasters were covered by insurance the overall number of natural disaster losses much higher then the last ten years even when one factors in inflation. Both overall and insured losses from natural disasters in 2017 were significantly higher than the corresponding averages for the last ten years. The infamous Hurricane Season of 2017 amounted to $215 billion in over all losses. While the two earthquakes in Mexico amounted to over $8 billion and flooding in China was $6 billion. Wildfires turned the western United States into an inferno which raged until the end of the year. The amount of loss for October alone exceeded $10 billion; this number will grow considerably higher. Worldwide, weather-related disasters comprised a enormous 93% of all disasters. The macroeconomic crush, not including smaller businesses that did not report, reached $320 billion. As far as global weather disasters 2017 was the costliest year ever! The long-term average for weather events since 1980 has been 41%, but in 2017 meteorological events skyrocketed to 81% of all losses. Putting this into perspective climate related events total about 8% and geophysical events such as earthquakes result in 3% loss. Of the four peril categories of disasters, river and flash flooding appear to be increasing the fastest jumping from 40% to 47% in 2017. Drilling it down, just how many relevant events did happen in the year 2017? 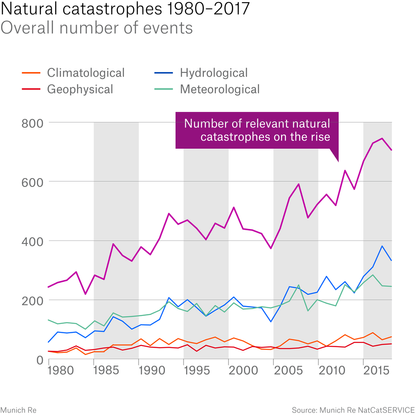 Notice on the chart below that almost all of the categories of catastrophe's are on the rise. The year 2017 experienced a small upward hiccup with the loss of 10,000 lives. That number is slightly higher than last year. The good news is that the trend is fewer and fewer people are dying from disasters. The 10-year average is about 60,000 and the 30-year average stands at 53,000 lives. 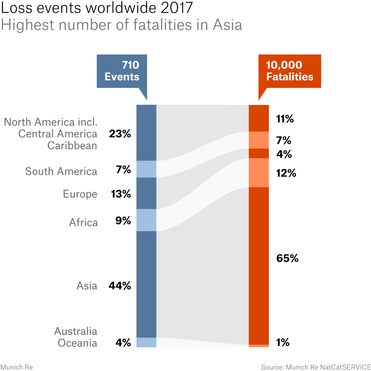 Most of the deaths from natural disasters in 2017 came from Asia at 23% followed by Africa and the US at 11% each, and 4% in Europe. More people die in emerging and developing countries than industrialized nations. Here is a Bird’s-Eye View of disasters in 2017 around the world. Severe thunderstorms cost $25.4 billion. Heavy rain triggered floods and landslides in Peru and Colombia that resulted $1 billion loss and 500 people were killed. Winter over Europe, leading to heavy losses in the agricultural sector, particularly in fruit growing, with a loss came of $3.6 billion. , Kenya and Somalia, hot weather and no led to drought losses of $ 950 million. The natural disaster year in Asia was more favorable than average. 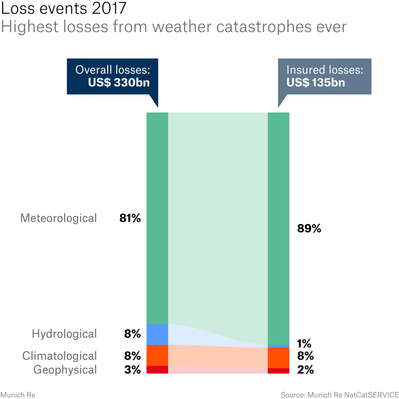 Five events that exceeded the $1 billion threshold for overall losses India, Bangladesh and Nepal were hit by severe monsoon rains. Tropical cyclones in Japan, China and the Philippines.